Boston Globe Love Letters No Longer a Kept Column? As the hardreading staff has previously noted, the Boston Globe is increasingly willing to rent out its editorial content willy-nilly to marketing sponsors. Crosstown at the Boston Globe, the $tately local broadsheet has allowed a marketer to get to second base with Love Letters columnist Meredith Goldstein. As we previously noted, ever since April the column has been leased out to – sorry, presented by – the Kripalu Center for Yoga and Health. Today, the relationship got even chummier. 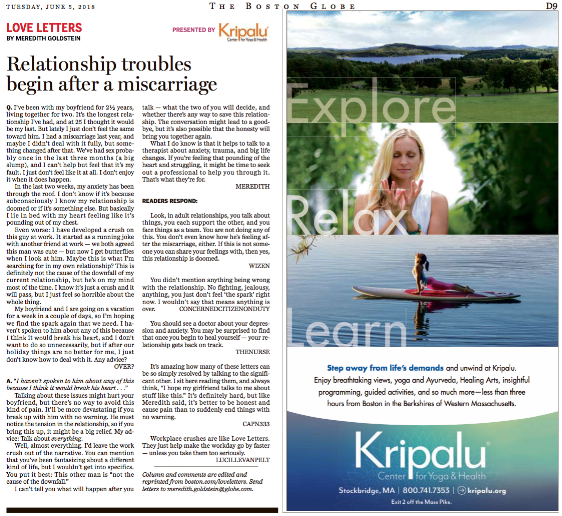 Beyond that, the Globe has relentlessly flogged the Kripalu-sponsored Love Letters podcast in quarter-page ads. So imagine our surprise when we saw this, well, naked edition of Love Letters in today’s Globe. Wait – have the Lovebirds torn the (broad)sheets? And was the breakup really necessary? This entry was posted on Tuesday, July 3rd, 2018 at 2:11 pm and is filed under Uncategorized. You can follow any responses to this entry through the RSS 2.0 feed. You can leave a response, or trackback from your own site. 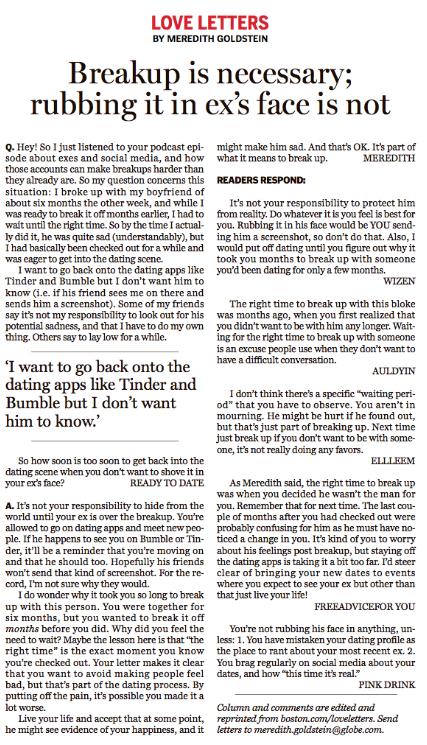 4 Responses to Boston Globe Love Letters No Longer a Kept Column? Was the ad part of the column or was the column part of the ad? Neither, really. The ad was sort of a sidecar. I guess I should have concluded my remark with: winking emoji goes here. Got it now . . .